Each year the KVIS endeavors to show Village employees in the Police Department, Department of Public Works, Fire Department, Clerk and other offices just how much we appreciate the work they do for the residents of Kenmore. What a better time of year to do this than in the cold and dim light of February, right around mid month. Each employee receives a heart-shaped box of delicious chocolates or a plump apple, their choice. We put little love notes of appreciation on each box, fill gift bags and baskets up with the chocolates and apples, put on a bow and dropped them off. We hope that this helps lift the spirits of all our valued Village employees and lets them know that the work they do is noticed and appreciated. 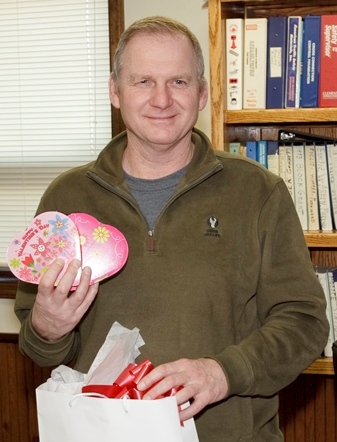 DPW Superintendent, Andy Mang accepts a bag of Valentine's Appreciation Gifts for his Department.